The Temple of Artemis is depicted here in this hand-coloured engraving by Martin Heemskerck. Today all that is left of this marvel is a few columns and some partial stairways. It was known as one of the Seven Wonders of the World, because it was built entirely from marble - with the exception of the roof. The site where this temple stood dates back to the Bronze Age. Since then, there have been several temples built on this site. The Greek Pausanias knew the site was very ancient even in his time. He stated that the inhabitants were Leleges and Lydians, and was older that the shrine of Apollo at Didyma. During the 7th century, the temple was destroyed by a flood which buried an ivory plaque of a griffin and the Tree of Life, as well as an amber tear shaped cross section of the north wall. Since then the temple has been rebuilt several times, it was finally lost to the entire civilized world of its era. The Temple of Artemis, which is located in present day Turkey, was built around 550 B. C. and was dedicated to Artemis - a Greek goddess. The temple took 120 years to build by Chirocratus, Scopas, and Praxiteles, Greek architects. The temple was built on a podium, a platform with 13 steps leading up to the temple. It was rectangular in shape like other temples of that time. The temple was used for both religious institutions and as a huge marketplace for many years. The temple had been visited by many people from all walks of life - including princes and kings. Many of the visitors brought artifacts such as bracelets, earrings and even statues from other countries. Some artifacts included beautiful necklaces. All of the artifacts were made from gold and ivory as well as other precious stones. 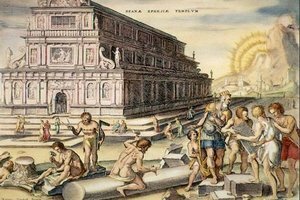 The story of the Temple of Artemis came down through history from a man named Pliny, who tells us that the temple was home to many fine works of art. This art included beautiful sculptures by Greek renowned sculptors such as Cresilas, Polyclitus, Phradmon, and Phedias. Pliny also describes the size of the temple as being 377 feet long and 180 feet wide, with 127 columns each 60 feet high. This made the Temple of Artemis 3 times the size of the Parthenon, the largest temple of a classical Greek building which is somewhat still intact today. Antipater of Sidon, the man who listed and visited all the other Seven Wonders of the World - including the Hanging Gardens, the Great Pyramids, the statue of Zeus, and the Colossus of the Sun - stated that although each one of these sites was very beautiful they were not even close to the splendor of the Temple of Artemis. The temple was mentioned in the Christian Bible in Acts 19:35, where the temple is called the Temple of Diana. The temple was influenced by many different religions from faraway lands; and the priests and high priests from each one of these religions came to Ephesus to worship. It wasn't until the year 1869, after a 60 year search, that an expedition from the British Museum found fragments of the statues and other artifacts. Today, the only remnant from the temple lies near Selcuk, Turkey. No one knows why the temple has never been rebuilt; or what happened to the believers. For this reason you can understand why the Temple of Artemis is considered to be one of the greatest unsolved mysteries of ancient history.